ZNEN RX-150 Scooter with Dual Halogen Headlights, LED Taillight, Dual Layer 13" DURO Sport Tires, Dual Shock Suspension, Dual Disc Brakes, Stainless Steel Nuts and Bolts, Hand-guards, Detachable Rear Trunk included! Free shipping, free helmet. Comes to your door near fully assembled! Unique Urban Sport body design, Bright Halogen headlight and LED taillight. Dual Layer DURO Knobby Tires; Sporty Muffler; Dual Disc Brakes; Dual Shocks. 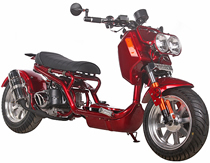 This gas scooter is EPA, DOT and CARB Approved and is registerable as a street legal vehicle in all 50 States including California. $99.00 a year; $150.00 for 2 years; $199.00 for 3 years (Best Deal). This discounted pricing is offered by the manufacture before a scooter is shipped. If you decide to purchase extended warranty after your order has been shipped, the original price will apply which is $400 for 3 years. The manufacturer's warranty starts the day when your vehicle is delivered. The extended warranty is effective as soon as the manufacturer's warranty expires. The manufacturer's warranty covers 12 months parts, if you were to purchase a 3 year extended warranty at only $199, your scooter's motor and other warranty parts will be covered under warranty for a total of 4 years . A150cc ZNEN motor costs $800 plus shipping , if anything happens during the first 4 years, we will ship you brand new motors free of charge, same way with other warranty parts. 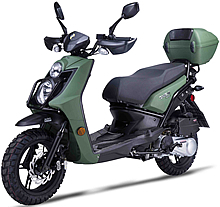 The RX-150 scooter comes to your door near fully assembled (battery set up, mirrors and minor adjustments are required). Estimate assembly time is 30 minutes. Be sure to tighten all screws, check for appropriate levels of engine fluid and fully charge battery prior to operation. Warranty is valid straight from the box. The 150cc ZNEN RX-150 gas moped features an upgraded dual telescopic fork high suspension system to make your ride as comfortable as it can be. This moped has two starting systems that allow this scooter to be very efficient. The electric start starting system makes simple starting even easier for anyone. The kick start can also be used at any time. The dual starting methods are very convenient in the event that one cannot be used, and it is always a great alternative to have two options rather than one. This gas motor scooter is equipped with a 150cc 4-stroke engine that has a 60 mph speed capability. This engine is very reliable and will outlast any other engine on the market. The ZNEN RX-150 scooter is also comes installed with a fully automatic transmission which is operated by the simple to use 'twist & go' throttle acceleration. 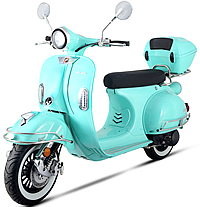 With this scooter, the rider will have no worries about using a clutch or gear shifting, because it is completely automatic and completely stress and worry free. There is a large storage compartment located underneath the seat. Use this extra space to put all your items that don't fit in the glove compartment. 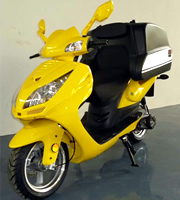 The RX-150 motor scooter comes free with a detachable rear storage trunk. This feature is great for any trip you take if you need that extra room to carry supplies. Wider with thicker padding. The seat will not fade or crack in any condition, nor stick to your skin. For safety precautions, be sure to fully charge the battery, and check/tighten all nuts and bolts prior to use. Also, be sure to check for appropriate engine fluid levels to ensure your vehicle is operating under the recommended conditions prior to use. Front Tires: 130/60 - 13"
Rear Tires: 130/60 - 13"
Assembly: This Item comes near fully assembled (mirrors, battery set up and minor adjustments are required). Be sure to tighten all screws, check for appropriate levels of engine fluid and fully charge battery prior to operation. Redefine the meaning of your lifestyle with the ALL NEW ZNEN RX-150 Moped Scooter. Take your daily commute from a tired ordinary ride into an exciting and flashy event. 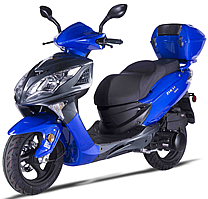 The brand new RX-150 is the king of moped scooter style while all the while maintaining performance and safety standards. This impressive and yet inexpensive scooter will make you famous in your neighborhood as " the person with that cool bike. " Close attention is given to maintaining the highest levels of quality. 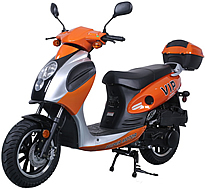 It's 150cc 4-Stroke Engine with high performance engine for increased speed, delivers all the power you need. With a top speed of 55 MPH it can easily keeps pace with traffic at highway speeds! This fashionable vehicle comes with Double Halogen headlights, LED taillight, Dual layer DURO sport tires, Hand-guards, Remote and alarm... A large matching rear trunk to carry your necessities, footrests for two passengers. With these latest improvements, it's exceptional power, sporty handling, and fuel efficiency this scooter's value is unmatched. At up to 90 MPG and the gas prices are fluctuating , a scooter is a great choice whether you're looking for dependable low-cost transportation or if you just want to zip around town, or for a trip to the beach. The Dual Disc Brakes with front ABS and a Fully Automatic CVT Transmission make this scooter both Safer and Easy to Operate. The "ZNEN RX-150" package is finished up with a road gripping Dual-Shock Suspension and Performance 13" big DOT tires. High ground clearance was designed for thin and tall riders. This may all sound great, but there's one thing you should know before you buy. Most brands of cheap scooters will ship them to your door, but they will only be about 65% assembled. This means you need to take it to a certified mechanic in order to put the rest of it together. So when it arrives at your door, your fun doesn't start quite yet. However, if you purchase a ZNEN RX-150, it arrives at your door near fully assembled! When you open the package, just put on the mirrors, set up battery, gas it up, and be on your way! Parts availability is 100%, we honor the warranty with no excuse!